Trying to come up with new holiday decorations is always a fun challenge. After buying a pumpkin to decorate for the month of October, I thought about how I could repurpose that old pumpkin… What was once my Cinderella Themed Pumpkin has now become my Thanksgiving inspired pumpkin. 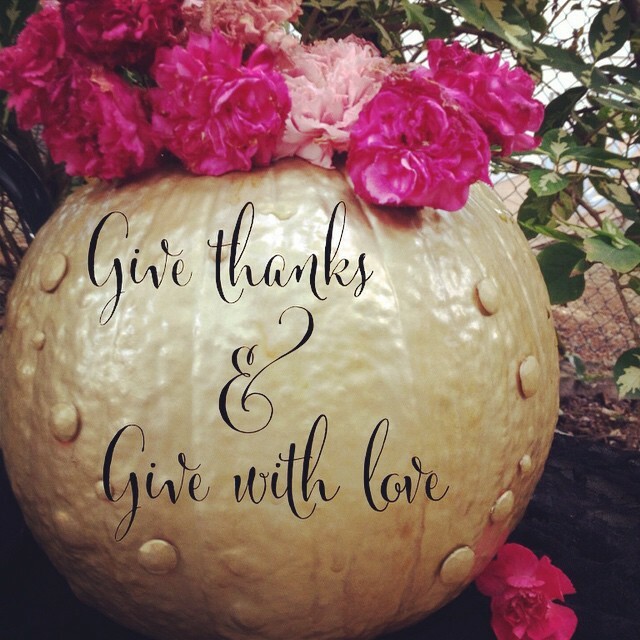 I chose to write this month’s blog theme onto the pumpkin, “give thanks & give with love.” It seemed seasonally appropriate. Step 1: Carve out the pumpkin. Originally, I didn’t carve out the pumpkin. Step2 : Decorate. I spray painted the pumpkin with a gold metallic spray. Hiding the original inscription, and modernizing the gemstones previously there. Step 3: Stuff the pumpkin with some brightly colored flowers. Carnations are great, they tend to last quite a long time. Step 4: Write an inscription. Thank you for your kind words. I am glad you enjoy reading my blog. Your blog looks great too!